Would you like to learn how to quiet your mind, how to be more creative or how to become your own best friend? A spiritual journal can help with this and with a lot more. It is such a powerful tool and yet so simple. It's easily accessible, useful for absolutely everybody and indispensable for anybody who practice meditation. My spiritual journal has become such an integral part of my spiritual path and my life that I don't know what I would do without it. Over the last few years I have written thousands and thousands of words in my journal and learned so much about myself through it. There are so many benefits that I've experienced by having a spiritual journal. Now I want to share with you all those benefits so you can feel motivated to start your own spiritual journal today. If you are writing a daily journal then you are already writing a spiritual journal, but I hope you'll learn here how to make the best out of your time journaling. There is a lot more to it than you might think of. Do you ever find yourself thinking over and over again, about a particular issue or problem, for hours or even days? Or perhaps you feel like if you are constantly thinking from morning till evening, and you wonder how you can silent your mind, at least for a little while? Don't worry, you are not alone, this happens to all of us. At some point or another we all face situations or life events that can cause some unbalance and trigger a constant chatter in our heads, even if these situations might seem insignificant or non-important. One reason might be because we need to find a solution to our problems so we keep dwelling on them non stop because it seems to be the right thing to do. Or perhaps we are trying to find some meaning or we are trying to understand a particular situation. Whatever the cause is, there is absolutely no benefit in keep dwelling again and again in the same problems. Solutions can't be found that way. Instead we consume our mental energy; we get anxious and stressed, which makes it even harder to think clearly, and we find it impossible to enjoy the present moment. True useful answers come from within and to be able to listen to them we need to be silent, we need to silent that constant chatter in our heads. A spiritual journal it's very helpful in this situation. Instead of keep repeating the same story in your head write it down in full detail in your spiritual journal. This will allow to empty your mind, leaving that metal luggage behind, and gaining some space and clarity. By emptying our minds while journaling we become light and have the clarity to understand a disturbing situation, to find solutions for our problems or to follow the right course of action to achieve our goals. Sometimes we don't really understand what is troubling us. We just know that something is wrong. We might feel depressed or anxious for no apparent reason. We might feel dull or demotivated, angry or upset. Whichever way we feel we can use our spiritual journal to let go of whatever is holding us back. Just express in paper what you are feeling, put every word that comes to your mind without questioning it or judging it. Allow things to come out without any restrictions. By expressing our thoughts and emotions on our journal we allow for a release of energy at an unconscious level. Believe it or not, just by doing this simple exercise you can regain your calm and peace shortly after. I have experienced this myself so many times. While writing whatever comes to our mind we can also become aware of our negative self talk, our inner critic. We will come face to face with that annoying voice that keep telling us that we are not good enough, that we don't deserve it, that we are stupid for even trying, that we are not prepared or experienced enough, and so on. It is actually very helpful to write down all those unwholesome, self punishing thoughts. Write down every angry, critical, attitude. By putting all those words out, as embarrassing as they might seem, or as painful as they might feel, we start to become free from them. By expressing ourselves in this way we become truly aware of these thought patterns and we allow to empty our unconscious mind of such mental habits. On the other side, if we don't express these thoughts they remained stored in the unconscious mind and continue to create havoc in our lives. Julia Cameron, author of The Artist's Way, A Spiritual Path to Higher Creativity calls this form of journaling "Morning Pages." She recommends to write by hand, every single morning, three pages of whatever comes to your mind. So we don't need to wait to feel unease or troubled to use our spiritual journal. It is actually better to do it regularly, every single day no matter what, even if we have nothing to write about. These morning pages are the primary tool that Julia Cameron recommends to heal our inner artists, for our own creative recovery. Yes, each one of us have an inner artist that has been silent by our inner critic and by other people's expectations. By emptying our minds and by expressing our inner critic, or Censor, we open the doors to creativity. It is from this same source that all answers to our problems come, it is from this same source that we receive a healing balm that heals our wounds and hurts. It is from this same source that all creativity is born. It doesn't matter if you have any artistic inclinations or not, I can definitely recommend you to read The Artist's Way (amazon affiliate link). It's a book for everyone. In one way or another we all need to go through this creative recovery process. Personally I don't use longhand writing for my journaling although I know this is the recommendation. I use a digital journal that syncs between my laptop and my smartphone. One reason is because I write much faster on my laptop, even on my iPhone, than by hand. Another reason is because I'm living a nomadic lifestyle. I live out of my backpack and I can't keep accumulating notebooks to carry. I could mail them to my parents but then I can't access them whenever I want to. So, my recommendation is to find whatever works best for you. Believe it or not we are fully responsible for the way that we feel, at all times. Nothing or nobody can make us feel sad, depressed, nervous, anxious, angry, hurt, jealous, afraid and so on. These are simply emotional responses that arise due to our interpretation of external events, and those interpretations are based on the beliefs that we have stored in our unconscious mind. In other words, we choose the way we feel, consciously or unconsciously, based on our beliefs. These beliefs are the filter through which we see the world around us. Luckily we can use our spiritual journal to have a dialogue with ourselves so we can become aware of our unconscious beliefs that trigger these emotional responses. This simple but powerful exercise can change the way that we feel instantaneously. This self dialogue method is a question an answers exercise that we do with ourselves. You can start by asking yourself "What exactly do I feel?" and then, "Why do I feel like this?" Answer everything and anything that comes to your mind. Trust that from within the right answers will come. I will share in a following post a specific method to have this self dialogue. So don't forget to subscribe by mail to make sure you won't miss it. Have you ever fallen into a deep depression, experience extreme anxiety, or even panic attacks? Or have you ever experienced such an intense emotional pain and feel mentally so out of balance that you fear you are losing your mind? No doubt life challenges sometimes can feel completely overwhelming, but whatever might have been the trigger, such an emotional turmoil is a clear sign that you are entering a process of emotional purification, or inner healing; specially if this is a recurrent issue. Each one of us carry within ourselves a wounded inner child. If we want to grow and become the best version of ourselves these past hurts and traumas, and the consequent negative interpretation of the external world, must be purified and release from our system. "What I did not see, until I started doing inner child work, was that it is the wounded inner child who forms the core belief system. By age-regressing into the inner child's trance, it is possible to change the core beliefs directly and quickly"
Although these emotional breakdowns can be extremely painful this is one of the greatest opportunity for self growth and purification. If we ignore it and suppress it we will certainly experience it again, and perhaps even with more intensity. "Every time we have a new experience that is in any way similar to the original trauma, we feel an intensity that is disproportionate to what is actually going on." John Bradshaw, Homecoming. To deal with emotional breakdowns like this it is always useful to talk with a friend or perhaps with a therapist, if we really need to. But it doesn't matter how good our friend is, or how much money we can pay to a therapist, nobody is available 24/7. However we can always talk with ourselves. We can become our very best friends and our own therapist. By expressing our pains and sorrows in our journal and by having a dialogue with ourselves we can reconnect with our wounded inner child and facilitate this healing process, discovering our deep routed traumas and past hurts. You can simply pour out all your thoughts and emotions in whichever way they come and you can also use the same self dialogue method that I described above, adding one extra question: When was the first time you can remember when you experience a similar pain? If you are living a situation like this I recommend you to read John Bradshaw's book, Homecoming, Reclaiming and Championing Your Inner Child (Amazon affiliate link). It will give you some greater insight into what you are going through. You could use your journal to do the meditations and exercises included in the book. If you want to know more about emotional purification you can read about my personal experience in http://ghchjgv.blogspot.com /2012/02/yoga-of-overcoming-negative-emotions.html">Yoga Sadhana: overcoming negative emotions. As we learn to talk with ourselves using our spiritual journal we start to become aware of our unconscious patterns, fears and limiting or irrational beliefs that are blocking us from living the life of our dreams. Once we have this awareness we will naturally start to reaffirm to ourselves the beliefs that we do want to have. This mental repetition is an affirmation, and the most powerful positive affirmations are the ones that we discover by ourselves, for ourselves. These are tailored to our own needs and personal development. By simply bringing to the surface our unconscious limiting beliefs they start to lose their power, and by using positive affirmations we start to record in our subconscious the new positive uplifting beliefs that we do want to have. So write down in your spiritual journal whatever affirmations you discover during your healing process or during your daily journaling; this is far better than reading somebody else's positive affirmations. You can refer back to them later on and you can use them frequently until they have become part of your mind. Nobody can tell us what our life purpose is, but it can simply be revealed to us when we connect with our heart. For this we can use our spiritual journal to answer one of the most important questions that we can ask ourselves: "What do I really want?" What are the things that I love to do? What kind of life I want to live? These are simple questions that help us connect with our heart. This is not an strategic-thinking-left-brain exercise. Think with your heart. When we are in a state of joy we are in alignment with our heart and that happens only when we are truly honest with ourselves, when we do what we really love to do, what we are meant to do. There is nothing mundane or materialistic about following our dreams and desires. They are the expression of our heart's will, they are the guiding voice of our heart. There can't be anything more spiritual than acknowledging them and do whatever it takes to bring them into existence. To get more clarity I recommend you to read my previous post http://ghchjgv.blogspot.com /2011/09/how-to-find-your-purpose-in-life-5-key.html" target="_blank">How to Find Your Purpose in Life, 5 Key Questions. Don't forget to use your spiritual journal to answer those questions. If you who have a sadhana or a spiritual practice you can use your spiritual journal to track your progress, experiences or development. For instance you can journal about experiences and insights that you notice while practicing meditation. You can record the length of your practice and what was your mental or emotional state before and after. You can talk about the qualities of your breath, the feeling of relaxation or tension in the body, your energy levels and so on. You can also write down how different life events affects your meditation practice or how your practice seems to be affecting your daily life, like your relationships or the ability to handle stress and challenging situations. You can do the same for your physical yoga practice, or hatha yoga. You can record your level of awareness and presence during your practice. Note the kind of thoughts you had, or what story was playing in your head, while you were practicing. You can write down how was the rhythm of your breath, how tense or relaxed did your body feel, and what was your mental and emotional state right after the final relaxation. Regardless of your religion or beliefs, and of whatever concept you have about God, you can also use your spiritual diary to write down your prayers or conversations with God. Instead of having a mental prayer you could have a written dialogue, or you could write down whatever answers, ideas or insights you receive while having your mental prayers. Don't rely on your memory alone to record these experiences. By writing them down you can also go deeper into these experiences and gain even a grater insight. The way that I see it, writing a spiritual journal is having a conversation with God. We are connecting with ourselves, we are having a dialogue with ourselves and letting that guidance from our hearts come to the surface. But this requires practice. "As I'd been in the habit for years of writing my thoughts down in letters (which I usually never delivered), I picked up my trusty yellow legal pad and began pouring out my feelings. This time rather than another letter to another person I imagine to be victimizing me, I thought I'd go straight to the source; straight to the greatest victimizer of them all. I decided to write a letter go God. It was a spiteful, passionate letter, full of confusions, contortions, and condemnations. And a pile of angry questions." This is how his conversations with God started. Notice that this conversations happened after years of writing his thoughts down. You can find more quotes in my previous post: http://ghchjgv.blogspot.com /2011/05/conversations-with-god-really-can-we.html" target="_blank">Conversations with God. Really? Can we really talk with God? You can keep your spiritual diary with you whenever you are reading an inspiring or spiritual book. Use it then to make notes of whatever insights you have while reading the book. These are really precious thoughts, don't let them be forgotten in the vast sea of your mind. You can also use your spiritual journal to record inspiring quotes from your favorite books. There is a reason why these quotes are meaningful to you. By writing them down in your spiritual diary you will be able to review them later on and contemplate on their meaning or significance. As you can see a spiritual journal it's all about self work and self growth, that's why it is called spiritual. It allow us to heal and to get closer to our innermost self, our true source of joy and wisdom. A spiritual diary or journal is one of the best tools that every one of us, regardless of our background or beliefs, can use to live a more fulfilling life with purpose. I would love to hear your thoughts. Do you have a spiritual journal? How has it influence your life? Can you suggest other tips for using a spiritual journal? You can share your answers in the comments below. 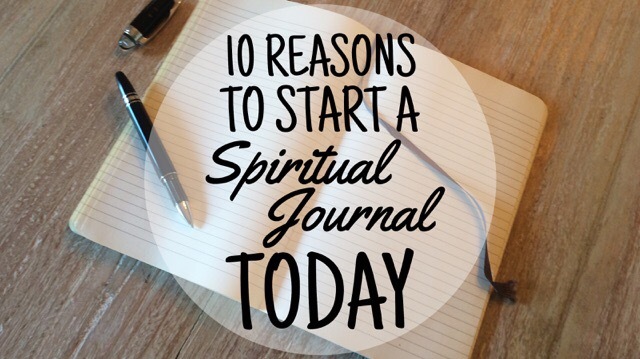 you just read the article about 10 Reasons Why You Should Start a Spiritual Journal Today and can you bookmark or share with link https://ghchjgv.blogspot.com/2016/09/10-reasons-why-you-should-start.html so thank you.